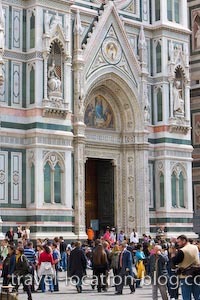 Picture of the decorative facade of the famous Duomo, and tourists in the city of Florence, Tuscany, Italy. the Florence Duomo, Tuscany, Italy. Crowds at the entrance to the Florence Duomo (Cathedral), the Santa Maria del Fiore, Piazza di San Giovanni, City of Florence, a UNESCO World Heritage Site, Province of Florence, Region of Tuscany, Italy, Europe.